The Emmys are this weekend, airing Sunday night, and I’m sure your viewing party invites are out, Hollywood-themed decorations are ready to go, and the red carpet is waiting in the wings, but wait!....what are you serving your guests? That announcement always sends chills down my spine just thinking about it! The Emmys are this weekend, airing Sunday night, and I’m sure your viewing party invites are out, Hollywood-themed decorations are ready to go, and the red carpet is waiting in the wings, but wait!....what are you serving your guests? I'm a celebrity fitness trainer who has trained Jessica Alba, Halle Berry, Anne Hathaway, and countless other A-listers, and I'd like to share my top 5 tips on how you and your guests can snack like a star at your Emmy party and still keep your waistline in check. Snacks rich in protein and fiber. This includes cheese, fruits, nuts, and fruit salad. Choosing snacks with protein and fiber will fill you up faster so you’re less inclined to overindulge. Often when I’m working on set with clients I stock their trailers with these items because it keeps them full of energy. Fun chips and dips. One of my faves is strawberry-avocado salsa with cinnamon tortilla chips. Healthy and tasty main attractions. I recommend clubs or wraps with avocados, white beans and sprouts, or a sweet potato and black bean salad. Cocktails. Toast the winners (or those with the shortest acceptance speeches) by adding refreshing twists to alcoholic beverages like vodka and champagne. Create a Low-Cal Sparkling Lemon-Lime Tini, a refreshing twist on the usual martini, by adding a sparkling lemon-lime flavored beverage and cucumber along with a mint garnish. Or, add ingredients such as apples, pumpkin spice, or berries to your favorite bubbly or sparkling wine to keep the celebration going and calories in check. Desserts . Whether store-bought or homemade, have fun and try it all! Television-shaped cookies, mini-Emmys made out of ladyfingers, even something like my client Jessica Alba’s favorite Blueberry Tofu cheesecake. (Check out my site this weekend for the recipe, or try this Tropical Tofu Cheesecake or Creamy Lemon-Lime Tofu Cheesecake.) Her favorite trick is to taste, but not indulge, so taste everything! Choose a smaller plate and sit down to eat and socialize at the same time. It takes 20 minutes for food to reach your stomach. Make sure you eat and hydrate during the day because if you are hungry before the festivities you will sabotage your willpower. My clients often walk the red carpet and attend parties and events and do it with control, moderation, confidence and an award-winning smile. Cheers and enjoy! 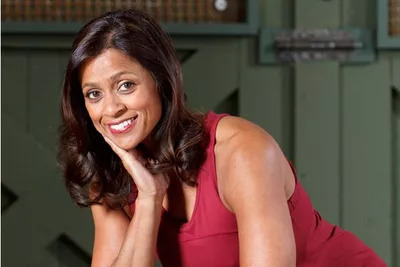 Ramona Braganza's love of fitness and quest for excellence has facilitated the transformation of hundreds of bodies and attitudes worldwide. Recognized as one of the top personal trainers in the world among the entertainment industry, Ramona worked as Jessica Alba's personal trainer for over 12 years and also trained such celebrities as, Halle Berry, Anne Hathaway, Kate Beckinsale, Eva Mendez, Scarlett Johannson, Zac Effron, Tom Welling and Michael Weatherly to name a few. She also consults with a number of companies including The Coca-Cola Company.